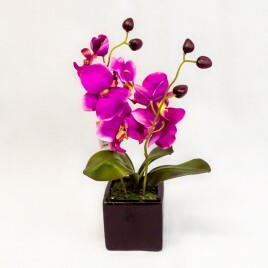 Mini Phalaenopsis Orchid in glazed black container. 2 stems with foliage. Available in Magenta or White. Max height 35cm. 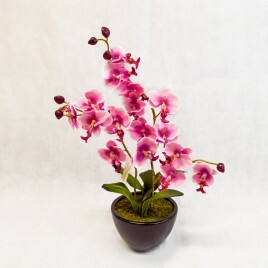 Attractive Phalaenopsis Orchid arrangement in glazed black container. 3 stems in shades of pink with foliage. Max height 50cm. 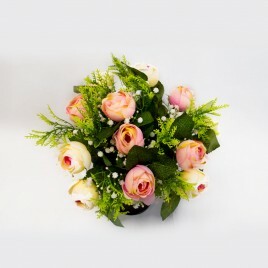 A lovely arrangement of ranunculus flowers with gypsophila and foliage. 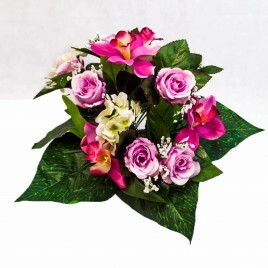 Set on a centre stem for easy arrangement. Available in two colours. Pretty silk flower arrangements - available in four colours and include hydrangea, rose orchid and gypsophila - displayed on a centre item for easy placing.